Even if bed bugs might not seem like much of a problem, if your bed or mattress is infested with them along with other areas of your bedroom, you will not be able to take self-treat. Once a bed bug infestation has occurred, it is not possible to simply vacuum them up and purchase some special spray from Home Depot or Lowes. The bed bugs are resistant to the store-bought chemicals and since the bed bugs are tiny and lie in crevices of the beds or make homes inside mattresses, it becomes nearly impossible to get rid of them without the help of a professional exterminator. The insects feed on your blood as you sleep and leave a small rash like bite marks on your body. These become itchy and can be uncomfortable. The female bugs reproduce quickly as you would be unable to find their infestation area of your untrained eye or their eggs. Pesticides that are meant for killing insects of different kinds (even ones made specifically for bed bugs) will not work effectively on bed bugs. 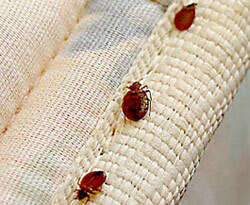 General pesticides will certainly not work and only make the bed bugs move to another area and infest a new area. That increases their living area in your home even more. 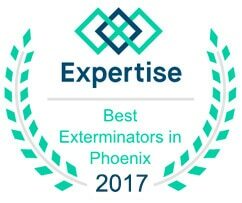 Do not hire just a general pest control company, you need a company that specializes in bed bug extermination. 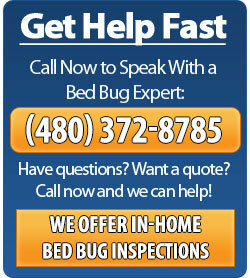 A bed bug expert will first inspect the affected areas in order to figure out the extent of the bed bug infestation. 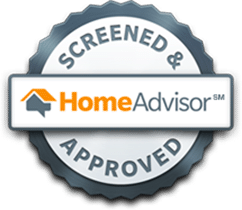 In most cases only one treatment is needed and will be 100% effective, but a follow-up inspection can be performed to ensure complete removal of the infestation. 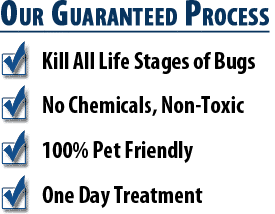 If you are looking for instant relief on the same day of treatment, a bed bug heat treatment is the type of treatment you are looking for. We heat the enture home to temperatures that will dehydrate all bed bugs and eggs that same day. No need to wait for the 30 days required with chemical treatments.